From the beaches of Africa, to the ports of the Middle East , a shark fin odyssey arrives back at Ground Zero... Hong Kong . 'Man & Shark' is book, and short film of the same name, which explores the barbaric practice of shark-finning in developing nations, so that consumers in Hong Kong and China can eat shark fin soup at their weddings, company banquets and other celebrations. The multimedia project aims to show why sharks, as the ocean's apex predators, are necessary to keep the marine ecosystem in balance. 'Man & Shark' also bears witness to the ignorance of shopkeepers selling shark fin in Hong Kong . It also explores why Chinese people eat shark fin soup in the first place, and the dangers to health from mercury poisoning. 'Man & Shark' was conceived in Mozambique , Yemen , and Hong Kong , and includes many underwater images of sharks from all over the world. Yesterday I was lucky enough to be invited to the Swire Institute Of Marine Science. Otherwise known by its acronym, SWIMS, the marine biology institute is part of the University of Hong Kong, and is located in probably the most isolated part of Hong Kong. It's right on the tip of Hong Kong Island's Cape D'Aguilar. To get there you have to pass along a very long and windy single track road with pot holes. Even though the institute is located in a marine reserve, where fishing is prohibited under Hong Kong law, incursions by fishermen are not uncommon. I met a Adela Jing Li, a student researcher from Hebei Province in mainland China. Pictured at right in the aquarium is a sea urchin, a nudibranch, a sea cucumber and some soft corals. I think. Adela is researching the effects of global warming on the seas around Hong Kong, and the marine organisms in it. Those are fish larvae in the petri dish. If I remember correctly, Adela's experiment has something to do with seeing how ever so slight water temperature increases can affect fish, and their reproductive cycles. Not sure what that has to do with this starfish though. Adela's fellow student is Stella Wong, who is pictured above reaching into an aquarium full of coral samples. Stella is an ecotoxicology PhD candidate studying "ecotoxicology and risk assessment of engineered nanomaterials, in particular nano metal oxides and carbon nanotubes, on tropical marine organisms". Quite. Both students are members of the Aquatic Toxicology & Ecological Risk Assessment (ATERA) Research Group. To get an overview photo of SWIMS, I climbed up a small hill to find a student hostel which is very idyllic, peaceful, and quiet. And cheap too at HK$60 a night for HKU students. Also on the hill is Hong Kong's oldest lighthouse which dates back to colonial days when the territory was a juicy target for pirates. Such a beautiful spot, I hope I can return to SWIMS soon! Finally. A positive fishy story from Hong Kong! This time from the Hong Kong Food Expo. This lady from Japanese company Tosakatsuo Suisan Co. Ltd is holding a tray of delicious 'pole-and-line' wild-caught skipjack tuna sashimi. For the unfamiliar, 'pole-and-line' fishing is a traditional, selective, therefore more sustainable, way of fishing for tuna. Only tuna of a certain size are caught, leaving juveniles to grow up to spawning age, and thus replenish future stock. Unlike long-line fisheries, it actually gives the fish a fair chance and is not greedy. In case you were wondering, that's 'pole-and-line' fishing happening on TV in the background of the photo. Industrial 'long-line' tuna fisheries are essentially to blame for the global collapse in tuna stocks. This includes the critically endangered bluefin tuna, and the yellowfin tuna, commonly eaten as sashimi, which is also heavily over-fished. 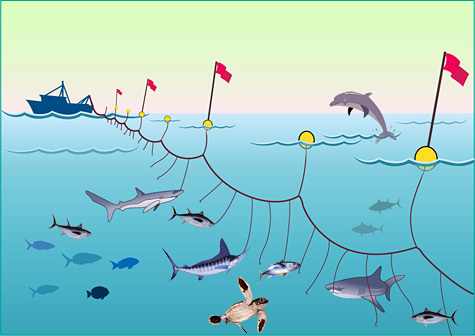 Long-line tuna fishing boats have also been heavily criticized by environmentalists for their incidental by-catch of sharks, dolphins, turtles and seabirds. The bottom line is long-line fisheries are causing havoc with the world's marine eco-systems. Part of the reason I'm posting this is to prove that I'm not anti-Japanese, as has been alleged by a few rabid and anonymous commentors on my Japan's Shark Fin Capital post last month. I even had a death threat from someone called 01kakusan on my YouTube page. I'm not anti-Japanese, I just took some highly emotionally-charged photos in Japan, and then put them online. I let the viewer decide. No. What Tosakatsuo Suisan are doing is commendable... and they are Japanese. Unsurprisingly, abalone, (latin genus name: 'haliotis', Chinese name: 鮑魚 'bao yu'), is on sale at the Hong Kong Food Expo. Abalone consumption is controversial because of the widespread depletion of global stocks by poachers and smugglers, many of whom have links to Chinese organized-crime syndicates. Some larger species of abalone have been so heavily exploited for food that many populations are now severely threatened. That includes the USA, Canada, New Zealand, Australia and South Africa. South Africa even listed abalone on the Convention on International Trade in Endangered Species (CITES) Appendix III in 2007, and two species of abalone are listed on the International Union for the Conservation of Nature (IUCN) Red List as 'Endangered' and 'Critically Endangered'. But no post about seafood (un)sustainability in Hong Kong would be complete without shark fin. According to a Friday report in the Hong Kong Standard, a one metre high shark fin was on display at the Food Expo on Thursday, but I didn't see it anywhere today. It was probably from a whale shark, but I would imagine someone told them that having it around wasn't cool. That is, given the current and growing anti-shark fin sentiment in the city. This woman was certainly not too keen on me shooting her nice little collection of juvenile shark fins. I showed her my press pass, and she seemed mad as I continued shooting unharassed. From the beaches of Africa to the ports of the Middle East, a shark fin odyssey arrives back at ground zero: Hong Kong. 'Man & Shark' is book and short film of the same title, which explores the barbaric practice of shark-finning in developing nations, so that consumers in Hong Kong and China can eat shark fin soup at their weddings, company banquets and celebrations. The book and short film aims to show why sharks, as the ocean's apex predators, are necessary to keep the marine ecosystem in balance. 'Man & Shark' also bears witness to the ignorance of shopkeepers selling shark fin in Hong Kong. And it explores why Chinese people eat shark fin soup in the first place, and the dangers to human health from mercury poisoning. 'Man & Shark' was conceived in Mozambique, Yemen, and Hong Kong, and includes many underwater images from all over the world. In detail, 'Man & Shark' follows the journey of a shark's fin, from the back of a shark swimming peacefully in the ocean, to when it is brutally sliced off by fishermen. The book documents the continued voyage of that fin as it makes its way by boat to the dried seafood markets of Hong Kong. From here, the fin is pictured as it makes its final journey through the kitchens of hotels and restaurants in the city, and into a bowl of soup. Ground zero is where the fin finally slips down the throat of a member of the Hong Kong public, who is largely unaware of the devastating effects of his culinary choice on the marine environment. The book highlights the co-authors combined experience of photographing sharks in the wild, and the savagery of the shark fin trade across the world. Readers will see the extraordinary beauty of these creatures and realize that the choices they make at the dinner table can make a difference to an entire species. Both Paul and Alex hope their book will highlight the main reasons why the consumption of shark fin soup is so damaging to the marine eco-system, and to the health of the consumer from mercury poisoning. The ultimate aim of the book is to help consumers around the world make an informed choice as to why it is best to pledge not to eat shark fin soup, and to show that sharks are beautiful, yet much maligned, animals that are critical to the continued health of our planet. Sharks should therefore not be considered as food. And that, believe it or not, is the last plug for our hard-hitting book on the global shark fin trade. I promise! Click here if you would like to buy a signed copy of our new book about the global shark fin trade. NB: Proceeds from the sale of 'Man & Shark' go to MyOcean a not-for-profit, non-governmental marine conservation organization registered in Hong Kong, (HK Inland Revenue Department Charity Number: 91/9233). After four long years, 'Man & Shark' will finally be launched at the Hong Kong Book Fair tomorrow. So it's been a busy week so far, what with writing press invitations, press releases, making banners, foamboards, media kits etc, on top of answering the non-stop flood of e-mails. And judging by the pre-launch buzz, we are expecting a pretty big media turnout! We will also be on hand for media interviews after the book signing, at 'Metro Books', 1BA01-11, Hall One, HKCEC. And the Japan sharks story is still rumbling along in the background too. This time a fantastic slideshow on NetEase/news.163.com, which is China's largest news website. That literally means hundreds of millions of eyeballs in China all looking at the brutal truth behind shark finning. And I also embedded my 'Japan's Shark Fin Capital' shaky iPhone video onto my Vimeo page. Getting all geared up for tomorrow. It's going to be a big day.